Metal ceramic crowns are used for total reconstruction one or more teeth. They are useful in cases where the damage on tooth is so severe, and it can no longer be repaired by fillings, while the root of the tooth is completely healthy. They imitate teeth functionally as well as aesthetically. Metal ceramic crowns are made inside from metal, which gives them strongness, and make them durable, and from the outside, they are made from ceramics, which is made from color and shape that matches your natural tooth. They can be made on teeth, and on teeth implants. 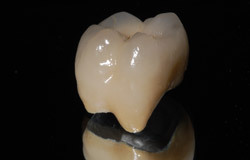 Besides these crowns which use metal as the base, there are crowns whose base is not metal based, they are made from zirconium which is also identical as your natural tooth. When the tooth is completely destroyed, is there any solution? Yes, if the root of the tooth is in good shape, we can make the crown on the rest of the healthy part, which will completely regain aesthetic view, and function of chewing. Do teeth with crowns look artificially? Metal ceramic crowns are recommended for back teeth, which are less visible, while, for front teeth we recommend a bit more expensive non-metal crowns, which almost look completely like your teeth, and only professional dentist can see the change between them and your teeth. Can I improve the look of my tooth which already have a crown? Yes. This procedure is common to improve look, color, position or size of your tooth. In aesthetic manner, you will get a perfect smile. The base of metal crown is alloy of Chromium, Molybdenum, Palladium, while the outside is ceramics. Besides this, for the base we can use various metals by your wish, as gold, titanium, but they are much more costly. Is it possible to repair old crowns? No. Old crowns are impossible to repair, it can not be added new porcelain layer, but you can make new crowns.